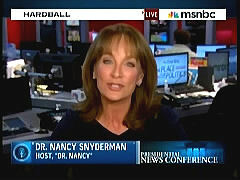 NBC's medical correspondent, Dr. Nancy Snyderman, was "rooting" for President Barack Obama to do well in selling his health care takeover during his Wednesday night press conference: "As a physician, you know, I felt like I understood the complexity of the problem. As an American citizen, I was rooting for the President to hit a home run." On the 10 PM EDT Hardball an hour after Obama wrapped up, Snyderman, who hosts the noon EDT weekday hour on MSNBC, fretted that he had "whiffed" in not making some persuasive points, such as using "plain talk to take the scare out of things like rationing, which basically is what's going on now - some people get medicines, some people don't. It didn't come through tonight." She also ominously warned of disaster if Obama does not prevail: "We're going to pay big time if we don't get this. I don't think we're going to be a great world power." DR. NANCY SNYDERMAN: The administration's made a big point talking about the new technology that's going to, sort of, electronically link all of us. That's billions of dollars and years away. So I think the plain talk, you know, to take the scare out of things like rationing, which basically is what's going on now - some people get medicines, some people don't. It didn't come through tonight. As a physician, you know, I felt like I understood the complexity of the problem. As an American citizen, I was rooting for the President to hit a home run. And frankly at the end I was afraid that he whiffed on a lot of the things that frankly, you know - people were looking for more substance than they got. CHRIS MATTHEWS: Do you think he answered any of the three questions I put: Give me the compelling reason for change, tell me what the change is and how you going to pay for it? Did he do any of those three? SNYDERMAN: Not to my satisfaction. And I think the way to have perhaps have done it was to say more plainly it's hard to see what's around the bend. However, it's like, you know, that ad we're seeing, you pay me now or pay me later. We're going to pay big time if we don't get this. I don't think we're going to be a great world power. I do think this can break the bank. But to say to everyone, you have to step up, and everyone has to do a little something. That responsibility message that he's talked about, I didn't hear much of that tonight either.